Yesterday was a special day in the cycling calendar. The first Tuesday of every March is Super Tuesday. On that day, all over Australia, between 7 and 9am at thousands of sites, cyclists are counted. The chances are that if you were cycling in the Geelong area yesterday morning, somewhere along your path, you were noticed and added to the tally. A number of our members took part in the count. Rosemary was, as usual, in Geelong West. The enigma here is how she carried the chair! Allan, Rick and Kelly were counting in the north of Geelong, where, increasingly, people are making use of cycling to commute to work and school. Helen was in Geelong West, on the corner of Minerva Road and Aberdeen Street. It was good to see an increasing number of children riding to school, with or without adult supervision. They seemed confident, and most chose to ride on the footpath (legal for children under 12 and those escorting them). This is a very busy intersection at peak hour. As well as hundreds of cars, there were 55 buses (most between 8 and 9pm) and around 50 b-doubles and larger trucks. The crossing supervisors did a brilliant job of keeping the school children safe. The data from Super Tuesday is used by councils to help them decide where cycling infrastructure is needed, and also to see trends in cyclist numbers. This year, cyclists were counted by gender. The number of female cyclists is considered an indicator of the success (or otherwise) of bicycle infrastructure. It will be interesting to hear the ratio of men and women at our Geelong sites. There’s a summary report for 2014 on the Bicycle Network’s Super Tuesday web page. Keep an eye on this page for updates of the 2015 count. Thanks to all of our volunteer counters. Cycling Geelong receives a donation from Bicycle Network for each person who completes the bike count. Volunteers, please let us know your rider numbers, and how many of the total were women. 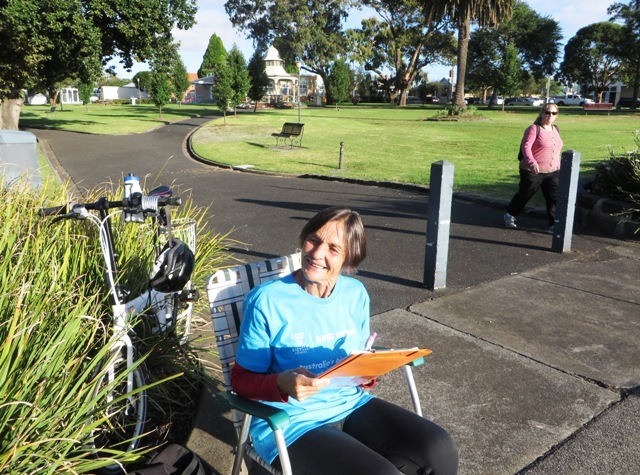 This entry was posted in Bicycle Advocacy, Bicycle commuting, City of Greater Geelong Council, Cycling events, Cycling Safety, Sustainable transport and tagged Bicycle Network, Super Tuesday Bike Count by hlyth2013. Bookmark the permalink. As most readers are aware there is a bike only track constructed between Myers Street and McKillop Street only on the east side and only one way. I have written to the GCC asking them of usage and an objective to test the success or failure of the project. From the answers I have received and putting aside comments like “in the fullness of time” I have concluded they have no way of establishing cost versus use. On the night before bin collections the track is rendered more or less useless and upon collection many bins are knocked over rendering the track useless, this can continue for several days as some people elect to take their wheelie bins in when it suits them. Most cyclists I see in that section road, be they commuters or team member(s) just use the road. Of course pedestrians use the path, even though it is signed bikes only and many can get abusive when you sound a warning signal. Seeing this article on counting I thought perhaps Cycling Geelong had conducted a count of cyclist using the bike only path and those using the road? Hi Peter, Are we referring to Swanston Street here? I was counting at the intersection of Glenleith Avenue & The Esplanade, Drumcondra. 32 cyclists came through, of which 9 were female.